How Solar Road Markers Work? The solar road stud, which is also called solar road marker, is an advance traffic safety facility applied in our daily life. It is applied to delineate the way for drivers and pedestrians at night or rainy or foggy days. Composed by the retro-reflective material, shell, solar panel, LED, and controller, the solar road stud is usually used together with the traffic lines. The solar panel on the solar road stud absorbs solar energy at night, which is transformed into electric energy and stored inside the accumulator or the capacitance, and the electric energy in the accumualtor or capacitance can be transformed into light automatically at night, which can give out light through the LEDs to delineate the streets and guide the sight of drivers or pedestrians at night. The solar road stud can be divided into the raised type and the embedded type according to the difference of installation position. The raised solar road stud is generally applied on the edge lines, and the embedded one is usually installed in the central lines. For the solar road stud installed in the central lines should have good performance in pressure resistance, in order to increase the pressure resistance of the solar road stud, the product should be embedded under the ground and only 5 mm left over the surface of the road. However, the stud used in the edge lines can work effectively even raised on the ground. 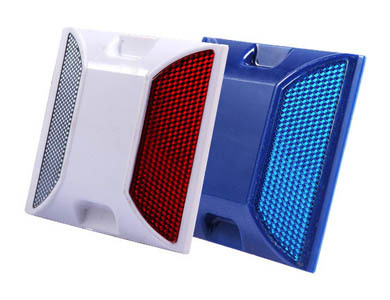 The solar reflective road markers can be divided into battery type and capacitance type according to the difference of the energy storage device. The service life of the capacitance type can be 5 to 7 years, and that of the battery type can only be 1 to 3 years. However, the embedded type of solar road stud has great influence on the road surface, and the cost of the capacitance type is quite expensive, so the raised solar road stud is widely applied in our daily life nowadays. There are various types of solar road studs, and the installation site of them are quite different. But no matter what kind of solar road stud, the pressure resistance is the fundamental condition to measure the quality of the solar road stud. For the solar road stud is a electronic product, and it is quite difficult to make the electron components has good performance in pressure resistance. Thus, the pressure resistance of the solar markers are not that good as the ordinary road markers. According to the standards of the related department, the pressure resistance of the solar road markers should be over 10 tons. 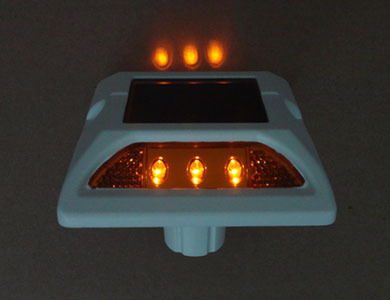 The solar reflective road marker of NOKIN TRAFFIC FACILITY is favored by our clients home and abroad. NOKIN has engaged in the field of traffic safety facility for over fifteen years, we have our own research and development team, who has always worked on improving the performance of old products and innovation of new ones. NOKIN mainly produces the road studs in plastic, aluminum, solar types, and so on. Our waterproof plastic road studs have been sold home and abroad for its high quality and perfect shape. NOKIN can provide the ODM service for you, and we would provide drawings and finished products as the samples that the clients give us.